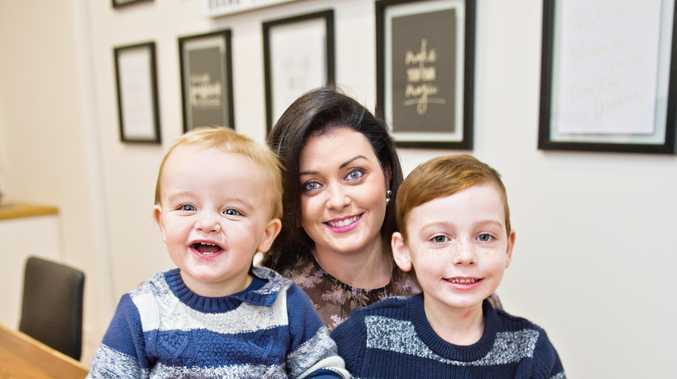 LAUREN Hope might be organised running three businesses, but when it comes to being a mother-of-two things are a bit more chaotic. Before becoming a mum, Ms Hope was career-focussed and busy working as a marketing co-ordinator at Murdoch Lawyers before joining the FK Gardner Group as marketing manager. She admits she never had plans of having children, she had not even held a baby, but said she would not have it any other way now. It was not until her son Slater was born she decided to start her own business to create more flexibility. That was in 2013. Now, Round Square Marketing has a team of five people and is constantly growing. "So basically I was working full-time for FK Gardner and I wanted more flexibility with the children so I decided to go out and start my own business," Ms Hope said. "It was literally started over a glass of red wine one night, no plan to do it. "I was just going to work from home and just do it a bit more as a hobby, and then I just had clients ringing and within three months we opened an actual office." City mum juggling three businesses, two kids: Lauren Hope leads a busy life. Ms Hope is busier than ever with Round Square, her other enterprise KAL Events as well as doing administration for her husband's business along with taking care of her sons Slater, now five, and two-year-old Hunter. "I'm very organised," Ms Hope said when it came to running the businesses. "We live in complete chaos at home but I think the most important thing is when I'm home I'm present with the kids, so I don't mind if the house is a complete mess." Despite her hectic lifestyle, Ms Hope is thankful to be able to attend things like school Mother's Day events with the option to work later into the night. "I knew I would always make it work," she said. "I have just got that attitude, whatever gets thrown you just have to make it happen. "I knew I was never not going to work because I love the outlet, I love coming to work and creating things for people." Her business manages everything from digital strategies and community engagement programs to website design and events, including the annual It's A Bloke Thing charity lunch and the internationally-renowned Diner en Blanc which is coming to Toowoomba in October. "I'm not foreign, there is so many working mums these days and I take my hat off to the stay-at-home mums as well because it's hard," she said. "But it's so rewarding at the same time to have a family and run businesses or do your hobbies." Send through your photos from Mother's Day to news@thechronicle.com.au.